Our world is in chaos, and we know our Eco-Goddess Warriors are taking every step they can to make it better. Monave and its customers are conscious of the cruelty tied to animal testing/byproducts and the dangers of harmful synthetic chemicals entering our bodies and ecosystems. We love our Mother Earth and are deeply concerned with how our actions affect her, but what if something as innocent and fun as glitter could be wreaking havoc on our marine ecosystems? In the spring of 2017, Monave announced to our customers that a new rainbow sparkle collection was in the works. Our vision was clear, and we were excited to start production on the new line. While researching ingredients for the new products we stumbled upon distressing information, an estimated 15 to 51 trillion particles, weighing between 93 and 236 thousand metric tons of microplastics entered our waterways in 2010, and we were part of the problem. 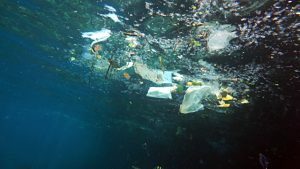 Microplastics are small pieces of plastic, 5mm or less, which can occur through the degradation of large plastic objects, or through manufacturing. Microplastics are used in many household products, from cleaning supplies, to toothpaste, your face wash, and sadly include our beloved glitter. While quite useful, the plastic bits are frequently washed down drains and are too small to be siphoned out by classic filtration systems, leading them to enter into our water ways. Its been known for a long time the devastating affects plastic pollution has on aquatic life, and we feel as if the only reason this hasn’t been a greater cause of concern for many people is the distance between us and the effects of the pollution, out of sight out of mind, but by that time these effects do reach us it will be too late. While much is still unknown about the effects of microplastics on the environment, they have the potential to affect every level of the aquatic food chain, from filter feeders, to fish, aquatic mammals, and birds. Microplastics have already been discovered in some birds, and oysters which have ingested microplastics have been shown to have lowered fertility rates, and this is not even considering the chemical effect the plastics could have. Chemical toxins such as DDT and BPA adhere to the microplastics and can be absorbed when ingested by animals, something which often happens because many animals mistake the small particles for plankton. While steps have been taken to cut down on microplastic pollution (The FDA banned microbeads from cosmetics in 2015), it is still important we do everything we can not to make the problem any worse. 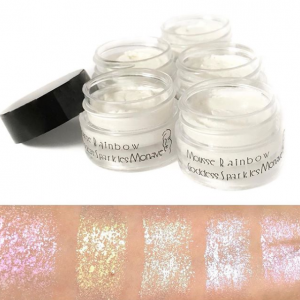 Our new Rainbow Goddess Sparkle Collection is made from mineral based glitter which is non-toxic, vegan, dye-free, carmine-free, and made from stuff found naturally in our waters. The interference pigments appear white at first glance, but when seen at an angle refract the light to reveal the beautiful colors of the rainbow. we decided to name each of the colors for water goddesses found throughout the world: Malaila for red, Tefnut for gold, Namaka for green, Aphrodite for blue, and Mazu for violet. We did this because we wanted to show that this is everyone’s problem, we are all tied to the water and are reliant on everything it gives us to survive. We want our goddesses to Sparkle! 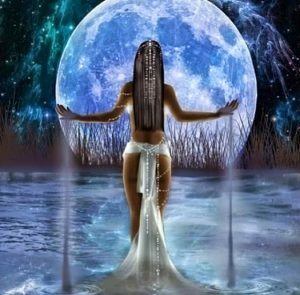 At Monave we celebrate Mother Earth and the feminine divine and want to provide everyone with the ability to be proud of how they glow! Feminine energy is all about the creativity, acceptance, nurture, and love for the world around us, qualities we want to help you outwardly project. These sparkles create a delicate look with a single stroke or can be layered for a more dramatic effect, either way they are perfect for all ages. We don’t believe anybody should ever feel wary to try a product because they think they are too old, at any age you can be playful and radiant, we love to add our sparkles to a simple makeup look to provide some unexpected color. Our customers value clean sustainable products and we are happy to provide an alternative to typical glitter. We hope that even if you do not buy our products, you do take into consideration the effects of your actions and the energy you bring to our Mother Earth. Custom Blending Vegan Makeup: How to Add a Pop of Color to Your Line!